All the information below is more than adequate to build your own gyrocam. Pre Built Gyrocams: Order here ! We've all seen the awesome shots of Rossi's behind dancing about on his M1 Yamaha pulling crazy lean angles and with the Gyro-camera technology, it seems to make the riding more awesome to look at with the bike basically laid across your 42" flatscreen TV! Here is a build log on how to make your own version based on a design by Wolfgang over in Germany. If you have built one and would like to send a donation to Wolfgang, contact us and we will be happy to help you do so. The design is beautifully simple and elegant in its solution, basically a control board hidden behind the camera is monitoring its own angle in relation to the horizon. As it detects itself moving away from the horizontal plane, it drives the motor behind to compensate. The board uses the "Aleksey Moskalenko" firmware as used by many of the RC hobbyists to control camera gimbals in all sorts of applications. Parts list with website links, click me! To avoid the motor slipping the outer magnets on the inner shaft after heavy vibrations or knocks, we firstly need to apply Loctite compound to the inner shaft. Start by removing the shaft lock grub screw from the motor, being careful not to drop it into the motor windings. Using a screwdriver or something similar which will make good contact with the inner shaft, push the outside of the motor against the screwdriver so that the inner shaft protrudes from the motor by roughly 5 to 8mm. Prepare your working area ready for applying the Loctite to the shaft. To apply the Loctite neatly, I used a cocktail stick so grab one of those and a paper towel to mop up any excess or spills. Carefully apply the Loctite to the inner surface of the motor housing. DO NOT apply to anywhere else! You also do not want to drop any into the motor bearings for obvious reasons! Now push the inner shaft back into its original position. I flipped the motor over so that the Loctite area was at the bottom against a piece of thin cardboard on top of the table and then gently pushed the shaft back into place. Wipe off the excess Loctite compound. Screw the grub screw back into the motor with a small amount of Loctite applied to the thread. Wipe off the excess compound carefully. Take the 3D printed motor housing and gently push the motor into it. Make sure to look at the back four holes to keep the threaded holes on the motor in position to accept the holding screws. Using some optional Loctite 248, screw four of the M3 x 6mm screws into the motor. Tighten the screws evenly and until they are snug. Do not over tighten so as to avoid damaging the plastic. Cut the power plug from the end of the two power wires, you can throw away the plastic piece, we won't be using it. Lay the control board into the housing. Thread the power cable through the hole in the back so that the board can lay flat. Check that the USB port is correctly positioned in the opening of the housing. Using the 1.5mm drill bit, carefully mark the plastic housing ready for using the battery drill. Use the battery drill to make some holes ready for the screws. You only need to drill a short way into the plastic to accommodate the screw thread length, but if you happen to drill all the way through the plastic it doesn't matter. Test fit the control board in the housing but don't fully tighten the screws yet. Once happy that the control board fits correctly, undo the screws and put the control board away. Take the motor assembly and thread the black wires through the bottom hole. It may be a tight fit to get the screws into the motor but use some patience if needed! Again use some Loctite 248 if you like and tighten the screws evenly but not over tight. The electrical connections use plugs and sockets that are made by placing a metal piece onto the end of a wire and then inserting that into the plug or socket. Connecting the metal piece onto the wire can be done using either of two methods. The recommended method is to use the crimping tools specified in the parts list PDF. However if you can't stretch your budget to buy them, you can solder the wires onto the metal parts. HOWEVER this can be tricky because you may not fold the metal tabs accurately after using solder. But it is possible with a little patience. I will show how both methods can be used. The motor connections shown below I did using the soldering method. The red power cable is shown using the crimping tools. The motor wires need to be shortened so that they can fit behind the camera. Connect the 6 pin multi-coloured cable to the control board. The board connections you need are the ones marked "Roll A/B/C". The other three wires will not be used so you can cut them off and make the ends safe from short circuits. If you have bought the 6 way plug from the parts list, it will be the white, blue and green wires you will be using. Rather than mess about with a ruler, simply arrange the items as seen here, and cut the wires so that they reach as far as the screwdriver on the right. Starting with the motor wires. Take three of the long pins that came with the "JR" connectors and one small and one large black plastic part. Here I used the soldering method to make the connection to the metal part. So bare back some of the outer plastic on each wire and using a small amount of solder, connect the wire to the pin. Repeat for the other two wires. Use a small pair of pliers to fold over the metal tabs where the wire joins the metal pin. You may have to repeat this until the wire can be easily pushed into the small black plastic piece. Insert all three wires into the plug, keep pushing the wire into the plug until the "square" metal shape is seen in the "window" of the plastic piece. Then give a gentle pull back to make sure it has engaged correctly. NOTE: It does not matter which way you arrange the wires in the part. You won't know if you did it wrong until you test the Gyrocam. At which point we can use the software tool to correct it. Now take the larger plastic piece and look inside it. You will see a small plastic tab that is used to hold this piece onto the connector. The tab clips into the "window" area of the small piece. So after checking again the orientation of the two pieces, join them together. The larger piece is the shroud which protects the metal pins. It should locate into a position which keeps the pins inside. If your pins stick out from the shroud you went too far! Don't worry if you get it wrong the first time, it will pull off again until you get it right. This is what this piece should look like when finished. Next we need another of the smaller black pieces and three of the metal parts which receive the metal pins. These make the connection for the black motor wires. 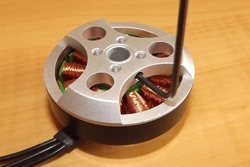 Using either the crimps or soldering iron, connect the metal parts onto the motor wires. Then like before, insert all three of them into the plastic piece until they reach the end of the hole. Gently pull back on the wire to make sure they are correctly positioned. The next step can be a little difficult so take your time. Insert the red and black power wires through the motor shaft. Start to lower the control board into the housing, carefully feeding the wires through the motor shaft as you go. Route the motor wires around the control board so that they sit flush with the plastic housing and are not crushed by anything. Gently ease the board into its final position and start to screw the screws into place. Hopefully you will end up with something that looks like this. Check that when you put the camera into position that you don't put too much pressure on the 6 way plug which connects to the control board. The final step is to connect the power plug onto the red and black power wires. Here I will show you how to use the crimping tools which will result in a much neater, stronger connection. Bare back a short piece of the plastic around the wire so that you can place the wire part into the shorter metal tabs. The longer metal tabs should then be in position around the outer part of the wire. Repeat for the red wire. Now take the metal piece and rest it into the "jaws" of the crimping tool. The metal tabs should locate into the top of a "mould" like this. Feed the wire into the metal piece and carefully compress the handles of the crimping tool making sure the wire locates correctly. The metal part should fold over both the outer plastic and the inner wire like this. Take one of the larger red plastic pieces and position it over the smaller red piece which is already connected to your power switch. Don't push it all the way on, it is only a guide to show you which way round the black and red cables should go. Then insert the wires into the red plug, you will hear a small click when the wire is positioned correctly. Pull the wire back gently to make sure it doesn't come back out. And there it is! A built Gyrocam. Next is the testing part, so mount the gyrocam onto your GoPro mount and get the 12V voltage source ready. Here I will be using a 1000mah 3 cell Lipo battery. So now to make the adjustments to the control board so that it controls the motor correctly for this application. Please note, you only need the "GUI" software, NOT the items called firmware. If this version doesn't work for you, try version "2.2b2" which may be needed if you received an older control board. If that still doesn't work, make contact with the seller of the control board to find out which version you really need. Your operating system may look for and install the USB driver automatically when you connect the Gyrocam to your computer, if not, use the .zip file here and download and install the drivers. Another option is to use these images as a reference on which settings must be changed. Compare these to how your board is setup by the manufacturer and adjust them to match these images below. How to do a six stage calibration for increased accuracy. Not essential but easy enough to do! Here are some general tips and tricks on using the Gyrocam and making sure your videos look as good as possible! 1) If you have been using the Gyrocam before but then on occasion you power up the camera and the Gyrocam settles into a level position BUT the camera is upside down, simply power off the Gyrocam, return the camera to the correct level position and then turn the Gyrocam back on again. Also, ONLY power up the Gyrocam when it is perfectly still, the sensor will not complete it's bootup procedure if you keep moving the Gyrocam OR the engine is running. 2) When you use a 1000mah Lipo battery with the Gyrocam you can expect the battery to last for upto 120 minutes, however the voltage supplied by the battery will drop over time. As the voltage drops the performance and strength on the motor will slowly become less efficient until the battery needs to be charged. The Lipo battery should NEVER be flattened completely, after using the battery for 90 minutes, we recommend recharging the battery or switching to a fresh one. a) Always try to position the Gyrocam on the bike in a place where it is least affected by road vibrations. The tail of the bike moves a lot more than the tank area so first re-test with the Gyrocam in another more stable position. b) Don't use any extension arms with the mounts, just screw the Gyrocam on to the clip with no extra arms between. c) To reduce vibrations from the bike's engine and road / track surface, you can modify the GoPro mounting clip like below to make sure the clip can't move around in the GoPro base. Use a strip of soft rubber or cork so that the clip cannot move up and down when in the base. Alternatively you can place a strip of duct tape onto the base over the ridge in the middle. d) As a last resort, you can run the GUI program and re-calibrate the ACC and GYRO settings. But it is rarely a problem with the calibration, 99% of the time it will be due to the Gyrocam suffering from external influences like the vibrations.